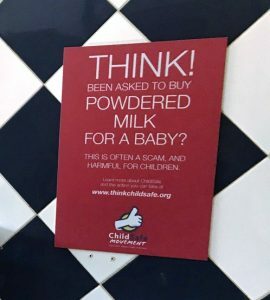 ‘Have you ever been asked to buy powdered milk for a baby when traveling? This is often a scam. 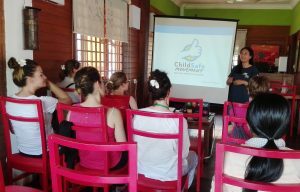 Back in 2013, Friends International’s ChildSafe Movement launched a high visibility campaign drawing attention to a milk scam happening in Siem Reap, Cambodia. Expat community members as well as local businesses’ staff had expressed their concerns regarding a lucrative scam targeting misinformed tourists. The scammers’ strategy was innovative and very effective. Female street beggars carrying an infant approached travelers strolling in tourist areas, said they did not want money from them but however implored them to buy powdered baby milk so they could feed their baby. The scammer brought the good-intentioned tourist to a specific supermarket or pharmacy which was in on the scam. Once the victim bought an expensive box of powdered milk, the beggar sold it back and shared the profits with the business’ owner. The travelers were fooled – they had literally bought in to a scam that not only emptied their wallets, but was also harming babies and infants, putting them out on the streets both day and night. Fast forward to five years later, and the Kaliyan Mith program reassessed the continuing prevalence of this scam in popular tourist areas. 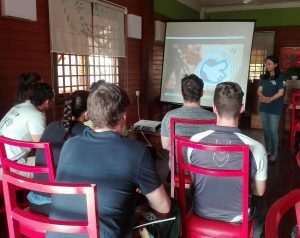 During April and May 2018, ChildSafe team members based in Siem Reap conducted several undercover observations around Pub Street. The purpose was to determine whether there were still active scammers and if so, how they had adapted their tactics. The monitoring’s findings have been quite encouraging. The number of milk scammers is continuously decreasing, most likely due to the installation of CCTV cameras in the City Center, police controls and interventions, the ChildSafe awareness raising campaign and NGOs’ support. 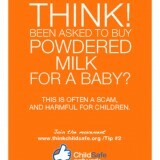 However, some infants are still being exploited and travelers successfully manipulated for the baby milk scam. In fact, female scammers, nowadays operating in unmonitored smaller streets, manage to avoid local authorities by begging during mealtimes and late at night. The fight to eradi cate this scam once and for all is not over yet. Everyone must be made aware of this scam putting infants in high-risk situations and compromising their physical, emotional and educational development. Let’s spread the message to our friends, families and co-workers. 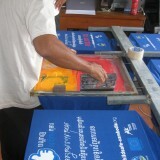 The more people are informed, the fewer tourists will fall into the trap, and the better children will be protected.